Stickers advising of "24-hour surveillance" have been pulled from election signs in Stephen Harper's Calgary riding after a member of the local Conservative campaign put them up in an effort to curb vandalism. The local campaign in Stephen Harper's Calgary riding was told to remove several "24-hour surveillance" stickers from the Conservative leader's election signs, after a member of the team put them up in an attempt to curb vandalism. The stickers started popping up on several campaign signs in Harper's Calgary Heritage riding a few days ago. The small, white-and-black stickers included a graphic of a surveillance camera and the text "24 hour surveillance," giving the impression the signs were constantly being monitored. 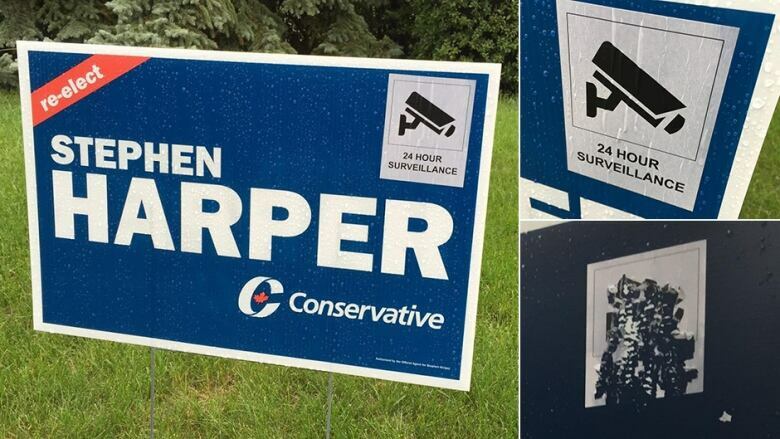 Conservative Party spokesman Kory Teneycke confirmed to CBC News on Tuesday evening that the surveillance stickers were put up by a member of Harper's local campaign. "It was someone with the local campaign who did that and [the stickers have] subsequently been removed," he said. "I think it was a well-intentioned thing by someone, but obviously not something that the campaign sanctions." Teneycke said he did not know how many stickers were put up. A CBC News video producer spotted several of the signs with stickers in a neighbourhood near Harper's constituency office on Monday afternoon. While the producer was filming the signs, a marked Conservative vehicle pulled up. A man got out of the vehicle and started scraping the surveillance stickers off with a screwdriver. The man did not want to identify himself. Teneycke said the national Conservative campaign team told the local campaign workers to remove the stickers after CBC News asked about them on Monday. Multiple calls and messages left with Harper's Calgary constituency office have not been answered. A staffer with the Conservative Party's media line initially told CBC News on Monday that to her knowledge the stickers had been put up at only one home. The staffer explained that a homeowner put up the warning after an instance of vandalism. When CBC News explained that the stickers had popped up in other locations, the staffer said she didn't believe that was true and that to her knowledge they had been placed at only one home. Local campaigns have been struggling with how to handle vandalism since signs went up in August. Many election signs have been vandalized, destroyed or gone completely missing in different parts of the country. Signs are a costly part of local campaigns and can be expensive to replace. Yukon Conservative candidate Ryan Leef decided to take matters into his own hands and made a citizen's arrest of a woman he caught vandalizing one of his signs last month. The woman claimed Leef came out of the trees in camouflage and handcuffed her. Leef said he had been in the woods installing a camera to catch vandals. CBC News spoke to a Calgary homeowner who had several Conservative signs on his property vandalized. He didn't want to identify himself, but said the surveillance sticker suddenly appeared on his sign after it was damaged. "I think that's only reasonable. If people are in the area that want to damage our signs … the signs should be protected. Especially when they go right on my private property and remove signs. I don't think that's correct." Photos of the surveillance stickers have been circulating on social media, where people have been debating whether or not cameras were watching the signs. Teneycke said there are no cameras. "My understanding is there was actually no surveillance or anything, it was just like some sort of placebo." He said sign vandalism has been a problem in every riding this election. "It's against the law and it's also, you know, it's more than just against the law, it's counter to the very Canadian principles of civil elections."